Welcome to another installment of If My Book, the Monkeybicycle feature in which authors shed light on their recently released books by comparing them to weird things. 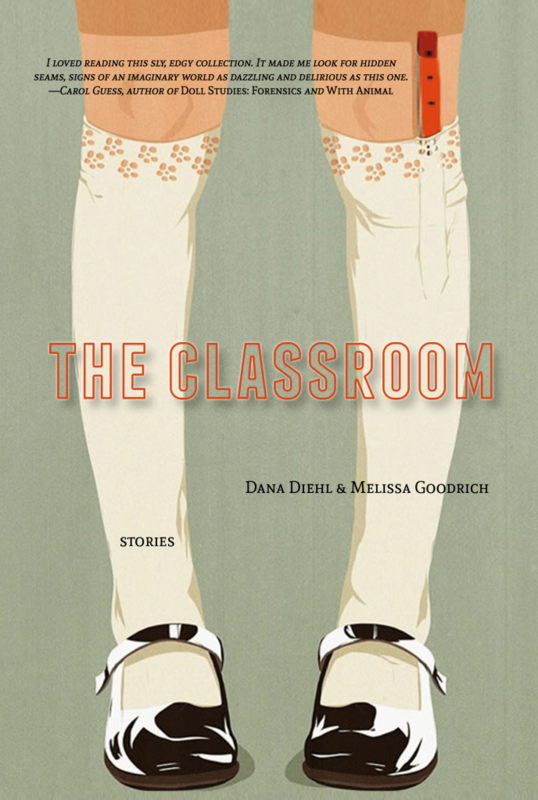 This week Dana Diehl and Melissa Goodrich write about The Classroom, their new story collection, out now from Gold Wake Press. If The Classroom were held back a year, it’d repeat the 4th grade. If a magic trick, silk scarves tied to silk scarves tied to silk scarves tied to silk scarves. If our book were footprints, bee-sized. Suggesting a complicated dance. If planted, a beanstalk. Grown in the window of a science classroom. Curling impossibly to the sky. If an era, the Paleozoic. Creatures growing teeth. Continents slowly crawling apart and together again, trying a different form. If our book were a shape, it’d be artery-shaped, violently coughed up: oddly beautiful, making you ask, this came out of me? If a place to escape to, the woods. If a punctuation mark, an &. If a monster, two-headed. Four-eyed. If a first date, skinny dipping in the lake. Toes reaching for the bottom. Feeling nothing. If our book were a Magic 8 Ball, it’d always tell you to ask again. Ask again later. Ask again later. Please. Answer unclear. Then again, if our book were a Yes/No question, the answer would always be Yes. Emphatically—yes. If our book were playground equipment, it would be the tire-swing spinning, thick-chained. Or the wooden bridge you’d run across pretending your classmates below were crocodiles. Because if our book were a crocodile you would want to run. If our book were toothed, it might bite. If an instinct, our book’s would be to burrow. Deeper. Further. Closer to the roots of the earth. If an outfit laid out for the next morning: ripped jeans, well-worn sneakers, binoculars, pocket-knife. If our book were a bad influence, it would take you to the edge of that lava field, offer you cigarettes and whiskey, lean in to kiss you. Night would fall. Our book would nudge you closer to that edge so vibrant you could feel the heat. Our book would make you feel dangerous and alive. You’d be a little drunk, sure. And our book—you’d kiss it back. Dana Diehl is the author of Our Dreams Might Align(Splice UK, 2018) and the collaborative collection, The Classroom (Gold Wake Press, 2019). Her chapbook, TV Girls, won the 2017-2018 New Delta Review Chapbook prize, judged by Chen Chen. She earned her MFA in Fiction at Arizona State University. She lives in Tucson. Follow her on Twitter at @servestofurther. Melissa Goodrich is the author of the collaborative collection The Classroom (2019), the story collection Daughters of Monsters (2019), and the poetry chapbook IF YOU WHAT (2012). Her stories have appeared in American Short Fiction, The Kenyon Review Online, Passages North, PANK, and others. Find her at melissa-goodrich.com and tweeting at @good_rib.